A British man was killed and his female companion was injured after a massive chunk of stone broke off the face of Yosemite's El Capitan on Wednesday afternoon, park officials and a climber who witnessed the rockfall said. 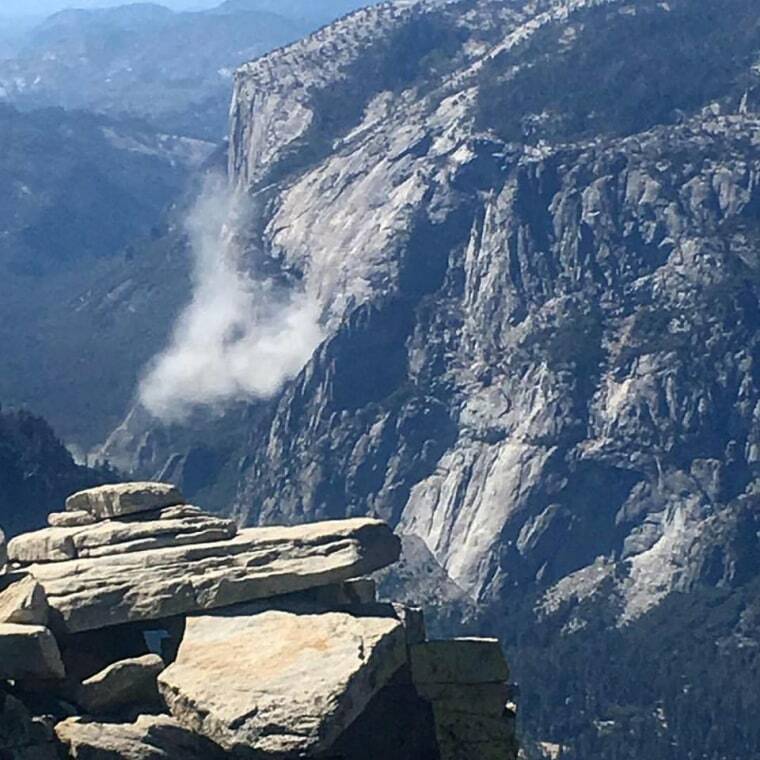 The rockfall on the more than 3,000-foot-tall granite monolith occurred at around 1:55 p.m. local time (4:55 p.m. ET) near the Waterfall Route, a popular climbing trail. The mass of stone fell from a height of about 650 feet above the base of the vertical rock formation, park officials said Thursday. The rare accident occurred during peak climbing season in Yosemite. Officials added that there were an estimated seven rockfalls on Wednesday, about the equivalent of 1,300 tons that fell. Peter Zabrok, 58, a climber making his 58th El Capitan climb on Wednesday, said the huge chunk of rock toppled about 1,000 feet as two or three people appeared to be hiking at the base. "I've never seen anything like that," Zabrok said in a Facebook video interview with NBC News from the side of the mountain. He called the rockfall "enormous," and estimated that the piece of falling rock was "about 100 feet by 100 feet by 100 feet." "The extremely frightening thing," Zabrok said, was that he and the two friends he was climbing with had just spent six nights "directly under the rockfall." "So if we had not climbed as quickly as we did, which is quicker than I usually climb, we'd be dead now," he said. Park officials said the identities of the victims would be released pending family notification. The male was found dead and the female was flown out of the park with serious injuries. Yosemite, located in Northern California, is about a four-hour drive from San Francisco. Rockfalls are common in the Yosemite Valley, with records indicating that 1,000 have occurred over the last 150 years, including at least 58 rockslides and rockfalls in Yosemite National Park last year, according to the park service. But the last fatality from a rockfall there occurred in 1999. There have been a total of 16 fatalities and more than 100 injuries since record keeping began in 1857, park officials said. "The rockfall from El Capitan was similar in size and extent compared with other rockfalls throughout the park, though it is not typical that there were victims," the park said. Zabrok said that he also saw one man rush into the main rockfall. "That guy totally risked his life," he said, adding that he wasn't sure if the man was a first responder or another climber. After the terrifying scare, Zabrok said he called his father to let him know he was OK.
"We're feeling extremely lucky to be alive," he added.